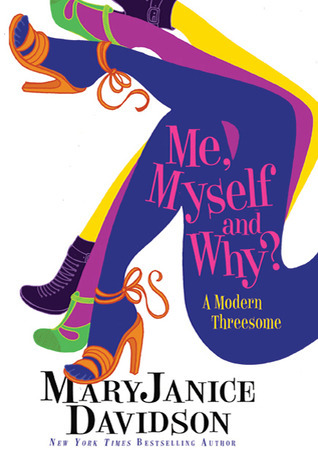 jennie's nails and tales: Book Club Friday: Me, Myself and Why? Woot, Woot! It's Friday. And I have a book to review! Double-awesome-ness! Yeah, yeah, the premise isn’t terribly realistic but that couldn’t matter less. Ms. Davidson delivers so many witty punch lines, and ties them in seamlessly in her character development, that it won’t take long for you to believe that a twenty-something woman with Multiple Personality Disorder* would make a fantastic FBI agent. But wait. Jennie, do you mean that the MC, Cadence, is an FBI agent with Multiple Personality Disorder? Yes. Yes, that is exactly what I mean. So the plot is similar to any other FBI mystery. There’s a serial killer on the loose, called the Threefer Killer because s/he leaves bodies in multiples of three, and it’s up to Cadence to crack the case. Or, I guess technically, it’s up to Cadence, Shiro and Adrienne. Shiro is the tougher personality and comes out when Cadence can’t deal with something. She’s really good at solving cases and focusing for a long time. Also, she’s super protective of Cadence, kind of like a stern mother who’d have you pinned on the ground in a choke-hold before you knew what hit you. And then there’s Adrienne, who is a complete effing lunatic. Her chapters don’t make a whole lot of sense but that’s because she’s a primitive kind of personality. Essentially, she’s the most dangerous of the three because she acts on impulse and would beat you within an inch of your life before getting bored and then robbing a liquor store. And did I mention that Cadence’s partner, George, is a diagnosed sociopath with a penchant for hideously tacky ties? There’s also a senior agent with an unhealthy obsession with knives, an agoraphobic secretary and a whole other slew of slightly unstable characters. There’s even a super-hot baker/love interest for Cadence, who made me want to do naughty things with buttercream icing. Very naughty things. I will admit that the first few chapters are kind of confusing. Mostly because Cadence sometimes switches personalities mid-sentence, which makes for abrupt chapter ends and starts, but after the first four-or-so chapters, I settled right in. The mystery itself is go-go-go, so between that and the amazingly hilarious characters, I read the book in less than four hours. Sure, the ending left me slightly confused but it didn't really bother me. I was just sad that it was over. Bahaha. Oh, Ms. Davidson. I love you. Thanks to Heather and Katie for hosting. *The new diagnosis is Dissociative Identity Disorder but that’s not what Ms. Davidson uses. She explains that it’s because nobody would know what she was talking about, which is probably true. You definitely make me want to read this book. Another great book review! This sounds really colorful and fun!! Haha, I love her bio! I've read her Queen Betsy series - which is hilarious, so I definitely added this one to my to-read list :) She's a great author!